Both members, Jesse Cohen and Eric Emm, have experience in the dance-pop realm and have released two EPs and a number of singles. Four years after hitting the New York scene, Tanlines has released their first full length album. 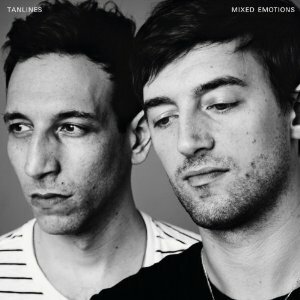 Their debut album, Mixed Emotions, is impressive for a number of reasons. First, you can dance to it. Second, you can sing to it. And third (and most importantly), this duo has found a balance in a genre where balance is extremely difficult. Synth-pop is tricky because it can be trite and gimmicky, but this album is inventive and creative while still grounding itself in experimental pop roots. This duo adds their own take with the addition of tribal drum beats and background noises that sound like the ocean. Tracks such as “Brothers” and “Green Grass” offer that upbeat quality we all love, while others are mellower. All of the songs, whether appropriate for a dance club or a stroll through the park, are smooth and appealing.